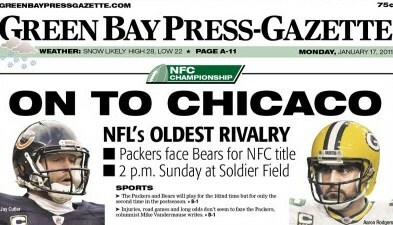 2011: The Green Bay Press-Gazette misspells "Chicago" in its lead headline on A1 ("On To Chicaco"), attempting to communicate that the Green Bay Packers would be facing the Bears in the NFC Championship Game in Chicago the following Sunday. 1995: 6,400 people are killed when a 7.2 magnitude earthquake hits Kobe, Japan. 1994: A 6.7 magnitude earthquake rocks Northridge, California, killing at least 61 people in the Los Angeles area. 1966: A U.S. Air Force B-52 bomber collides with a KC-135 refueling plane over the Spanish farming village of Palomares, killing seven airmen and causing four unarmed thermonuclear bombs to plunge to earth. Three of the bombs are found on land; the fourth is recovered from the Atlantic ocean after an extensive search-and-salvage operation. To learn more about this nuclear weapons disaster read The Day We Lost The H-Bomb.